Like most animals cockroaches need food, water and shelter. These 3 requirements are present in most houses and buildings where humans live and work. The following practices are likely to make buildings less suited to supporting a cockroach infestation. Keep garbage in sealed containers. Use vacuum cleaners to remove food waste from floors and cupboards in kitchens. Fill in cracks and crevices in walls and cupboards to prevent cockroach access and harbourage. Eliminate all food sources, including crumbs. This is achieved by cleaning up at the end of each day so that food is not available at night when cockroaches are active. Eliminate or reduce water availability, for example, containers with water, leaky taps or pipes. Store food in sealed containers and in refrigerators to reduce accessibility by cockroaches. Wash on a daily basis, all pet food bowls, and take them in during the night. Compost heaps and piles of dead leaves etc. should be kept as far from the house as possible. Likes warm moist cavities such as those found behind paneling beneath the kitchen sink. 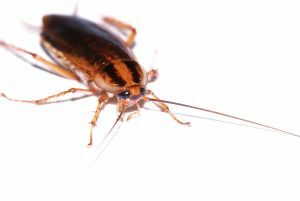 It is also found in large numbers in sewers and some homes are particularly vulnerable to repeated infestation by cockroaches from nearby sewerage systems. 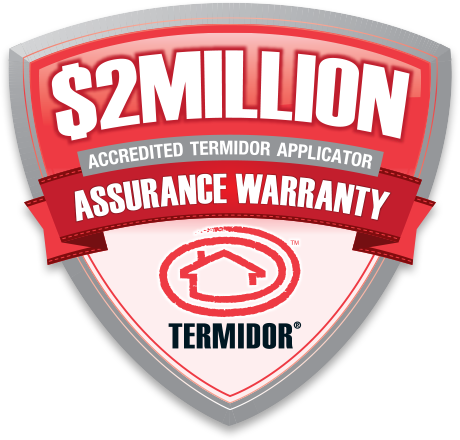 American cockroaches can be difficult to control adequately if they are living in cavities that cannot be removed. For instance, kitchen cupboards are often constructed with a back panel so that there is a cavity between the panel and the wall. If such a cavity is not sealed, cockroaches are likely to find it and breed in it, particularly if the wall is damp or the panel is beneath a sink or basin. Cockroaches like hiding under fridges and stoves or in horizontal or vertical cavities at ground level. -Like almost all cockroaches, eggs are laid in an egg case called an ootheca. -Each egg case contains about 12 to16 eggs. -The egg case is usually hidden in a crevice or glued to surfaces in close proximity to food and water. -A single female can produce about 12-24 egg cases over the warm summer months, and up to 50 egg cases in her life time. The nymphs undergo 7-10 moults over a period of 6-12 months before they reach maturity. (30 mm long). Adults can live more than a year, so with the younger life stages included, the life span can total near two years. 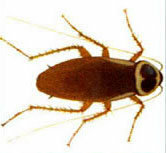 The Australian cockroach is reddish brown in colour, with long antennae and yellow edges on the front part of the forewings. Despite their name, they are not native to Australia. They originated from Asia. They became totally adapted to the domestic life, and are a major pest in households. When they occur in houses and restaurants, they can contaminate food with droppings and secretions. They have three pair of strong legs and are very good runners. Antennae are longer than their body. Body is flat and broad so that they can squeeze into very tight places. wings are membranous with toughened forewings which overlap left over right. Head is small and pointing downwards, concealed under the pronotum, this protects their head when traveling through gaps and tunnels. Sometime their thorax are miss-considered as their big heads. They are very active at night. The German cockroach is found in homes, apartments, restaurants, hospitals, or other buildings where food is stored, prepared, or served. The adult is pale brown, and has two dark brown lengthwise stripes on the shield behind the head. Adults are winged but rarely fly. Under ideal conditions, they may live up to 12 months. The slender egg case is long and light tan. The female carries it at the tip of her abdomen until the eggs are nearly ready to hatch. The case is then dropped in a secluded location and the nymphs can emerge one to two days later. A female may produce four to eight egg cases during her lifetime, each containing 30-40 eggs. German cockroach nymphs are darker than adults. The most characteristic marking is a single pale brown stripe separating two dark brown stripes running about halfway down the middle of the upper abdomen. The German cockroach produces more eggs and has more generations per year (three to four) than other cockroaches; thus, a troublesome infestation can develop rapidly after the chance introduction of a few individuals. These cockroaches are often accidentally brought into buildings with groceries (especially bagged potatoes and onions), beverage cartons and cases, used furniture and appliances, and dry cleaning. Adults may also migrate from nearby infested dwellings. German cockroaches normally inhabit the kitchen but are also likely to occur in the bathroom, particularly if the kitchen and bathroom share a common wall. During the day, adults and nymphs may be found hiding clustered together under, around, or even in the walls of appliances such as stoves, refrigerators, and dishwashers; around sinks, especially in the dead space between the sink and wall; beneath or around the water heater; under, inside, or in cracks around cabinets, closets, and pantries. The Brownbanded cockroach is relatively small 10-14 mm long. Adults are pale brown in colour with very pale bands across the thorax and abdomen. The female’s wings are somewhat reduced, which those of the male extend pass the abdomen. Egg cases, which may contain up to 18 eggs, are glued to surfaces, and the hatched nymphs require 2-4 months to develop into adults. Adults typically live up to 6 months, during which time the female produces up to 6-13 egg cases. 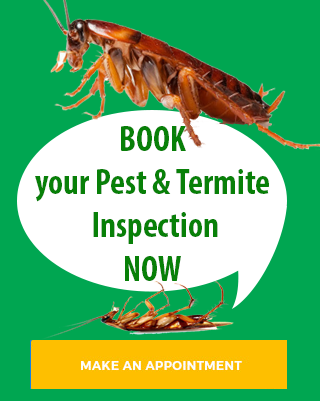 This cockroach tends to be an indoor pest, frequently infesting the dwelling parts of building, as well as offices, hospitals, restaurants, storerooms and so on. Unlike the German cockroach, it’s activity may be scattered throughout the building rather than being restricted mainly to the kitchen and wet areas. 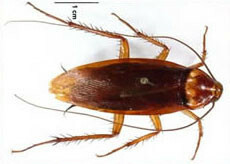 The medium size oriental cockroach is dark brown to black. The female has much reduced wings (present as wing buds), while the male has wings that cover most, but not the entire abdomen. Adult lifespan is usually about 3-6 months, and a female may produce up to 14 egg cases during her adult life. Egg cases are usually glued to surfaces and may contain up to 16 eggs. Nymphal development may require 6-18 months. The oriental cockroach is a major pest of building in Britain. Its preference for relatively cool conditions is reflected in its more southern distribution in Australia, where it is commonly encountered outdoors (under leaf litter and bark) and in damp subfloors, and around drains. It’s relatively sluggish and is usually located at or below ground level in building. It feeds on a variety of decaying organic matter, frequently feeding in garbage disposal areas. As well, starches and sizing of wallpaper may be attacked. The Smoky brown Cockroach is often encountered in the coastal areas of Australia. They are nocturnal and prefer foods of vegetable origin. The species typically breed in gardens where organic materials are used, and enters indoors from these sites. It is large, about 30mm in length, with a uniform dark brown to almost black body. Both sexes are fully winged and capable of flight. The female of this species also produces large egg capsules.